On a Mac, I am using AVG as the primary AV. In addition to this, I have a few scanners (Bitdefender and Malwarebytes) that I update and use periodically. Recently I decided to add Kaspersky's free scanner (from the App Store) to this list as well. Not surprisingly I am rather concerned. Is Kaspersky unreliable (keeping in mind recent rumors)? Are these false positives? Is my computer already compromised? And most importantly, what do you knowledgeable folks suggest I do now? The KDC file types that were caught by AVG do not seem amenable to inspection by a non-specialist user. 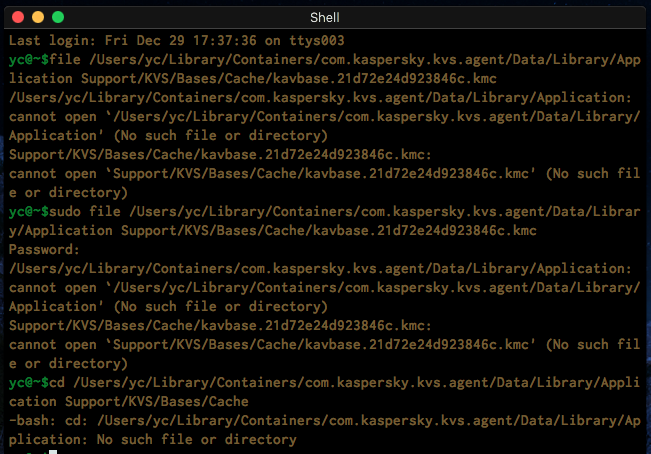 Disregarding the issue of one AV complaining about the other, seems very odd there are lingering base files even after uninstalling Kaspersky and rebooting the system. 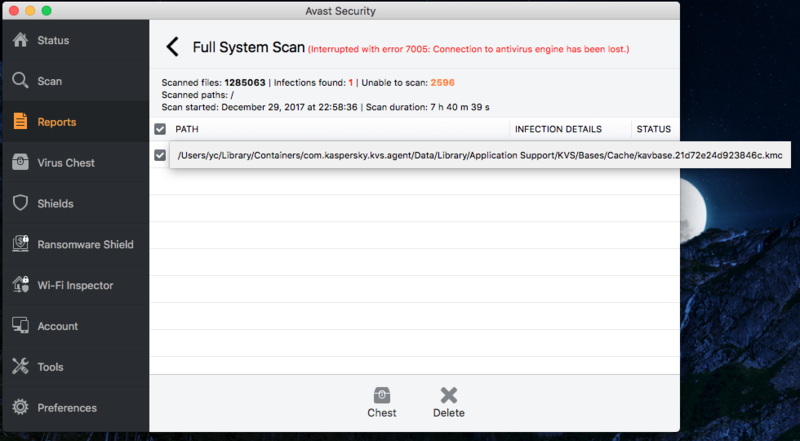 Even more interesting oddities: The file caught by Avast seems to exist in the Mac Finder (on right clicking in the AV window and doing show in Finder) but not when I try to find it in the terminal. Doing >file /path/to/directory/of/infected/file/ says there's no such file or directory. But doing "Go to the folder" with the same pathname works just fine. They are false positives. Usually, is not a good idea to have two different AV software installed. One can block other as is your case. In your case, concretely, it seems it's blocking database files. Maybe it has some known virus pattern. Of course, any AV has itself and its files as exception on detection but it is not know for other AV software and that's the reason why is detected as malware. 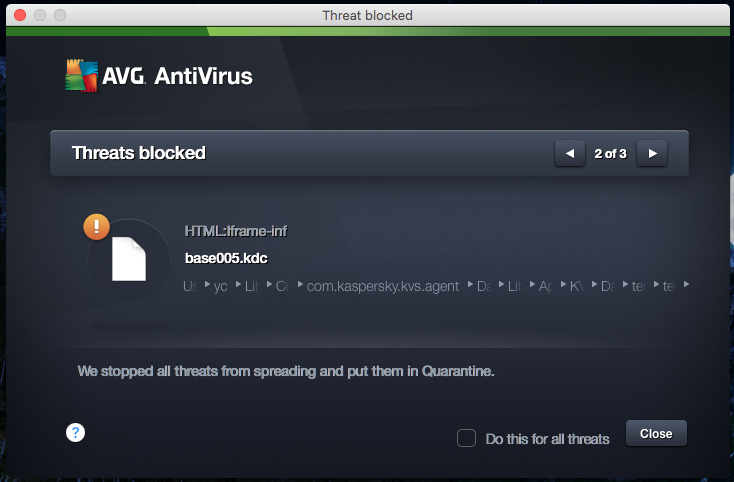 It is highly probable a false positive, if you download the antivirus from the legitimate source. Usually, Antivirus will unpack any signed file, regardless of the file signing certificate. Most Antivirus vendor will selectively store competitor certificate to prevent false positive. But there is always exceptional. As casual user, you can submit the quarantine file to correspondence AV that report it to check for false positive. In addition, it is bad idea to have more than one prominent brand of Antivirus install in your system, as they will compete for resource to do redundant work. Not the answer you're looking for? Browse other questions tagged malware antivirus detection trojan iframe or ask your own question. Kaspersky Lab malware faking. How worried should I be? Why Antivirus Detects Simple Java Program as Trojan? 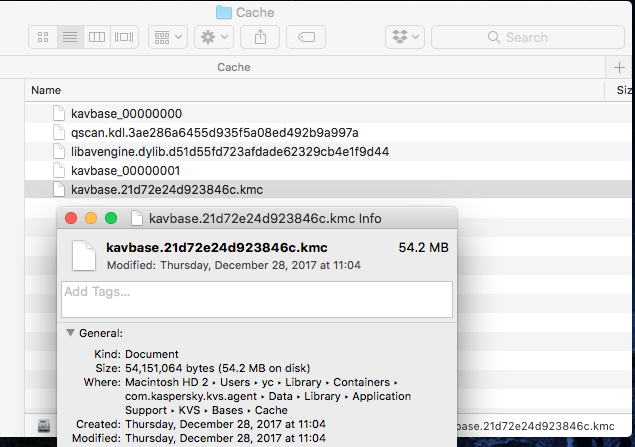 Retrieve a deleted trojan by Kaspersky for analysis (on windows 7)? Can malware attach itself to user files? My website is blacklisted by Kaspersky. Does that mean it's infected? Kali.download website blocked by Kaspersky because of Trojan, is it safe? Is Kaspersky Total Security a good choice against malware?